Maybe you have come across our laughing kratom tree, kratom wallpaper or ads for bikhuk kratom merchandise. This is all part of a small guerrilla marketing campaign to plugg our Kratom to a more wider audience and raising a bit of awareness for our "brand"of Kratom. Starting this week, bikhuk.com also launched a number of goodies, including; Kratom Head caps, I'm kratomized shirts, Shoes, Tea mugs and other merchandise. Although we do not have any intention to become a successful seller of these, they are indeed available. The Kratom Man delivery service is not yet operational, and probably never will. But if you are looking for a bikhuk kratom reseller nearby, do not hesitate to contact us. Besides the different strains of Kratom, there is a clear distinction between what is called Red Vein Kratom and White Vein Kratom. 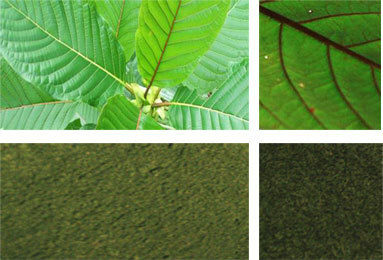 Although often found in the same regions, some areas have more Red Veins Kratom Trees and other more Whites. Borneo and Malaysia have more red kratom and Sumatra have relatively a higher population of white veins, for example. Besides the geographical spread, the whites and the reds also have a different composition of alkaloids, causing different kratom effects. More sedative even in lower dosage, local who used this traditionally said it caused a nice "buzz" but is less stimulating then his white vein brother. Traditionally it was often used for pain relief . Powder and crushed leaves of the white vein kratom tend to have more stimulating effects and some experience a more euphoric feeling from the whites compared to the red. 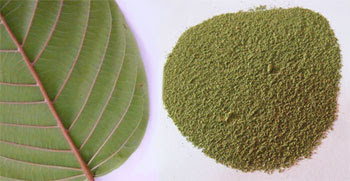 White vein kratom is known to give extra endurance and is used by the traditional users for endurance in labor, training and exercise. Traditionally some natives prefer to mix the both, which is indeed worth trying! This is a lovely sight. Although the FDA and the DEA in the US have expressed concerns about the Kratom Tree, former president Bush just went ahead and started to plant some himself. 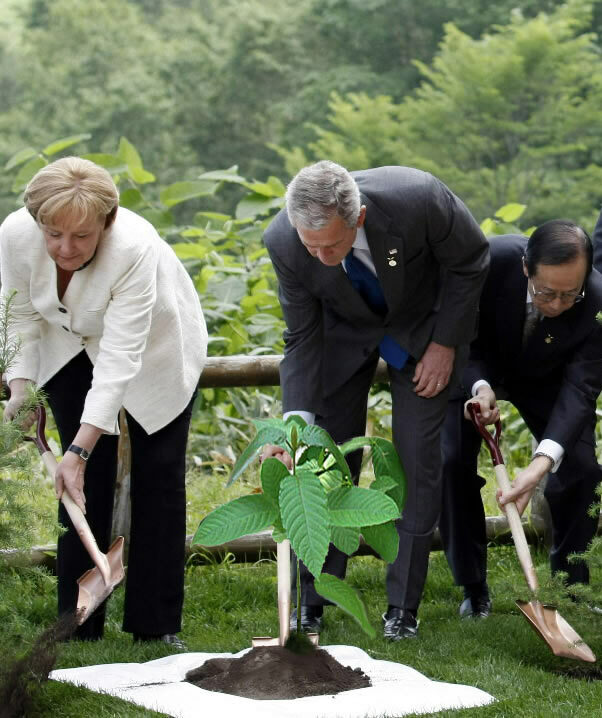 Angela Merkel's BfArM also has been discussing a possible ban of this fine tree, but so far no decision has been made, next discussion is probably in december 2010. As for the recreational use of the tree, it is, compared to smoking and drinking, a lot healthier. Besides the fun part of kratom, more and more people are experiencing benefits from the kratom leaves and powders in overcoming opiate addictions, for pain relief and other herbal self-treatment. Regardless of what the public desires and with complete lack of understanding for the tree's true nature , a growing number of governments are banning this lovely tree. It would be nice if more government officials, start respecting this beautifull gift of nature and follow the example of Bush and Merkel. Indonesian Kratom - Its Good! Although its sometimes said that Indonesian kratom (or indo kratom as some call it) is less strong compared to Thai or Malaysian Kratom, this is not the case. When we started to develop our first kratom powders, we noticed that there was little local knowledge in Indonesia about the kratom tree and its properties. Other then Thailand and Malyasia, indonesia does not have a rich culture of Kratom consumption. Therefor harvesters and suppliers did not have much experience in gathering the right leaves nor did they have knowledge on how to process the leaves well. As a result, a lot of low quality local kratom has been distributed the last few years. By implementing better harvest & processing techniques, Indonesian Kratom can be just as strong, if not stronger then most Malaysian or Thai Kratom. Choice of leaves to gather, propper drying and curing of the kratom leaves all contribute to a better Kratom powder or product. Besides this, due size of the Indonesian Islands, it has much more variety to offer. Some vendors managed to get better results in the past with Indonesian kratom strains and marketed them with promissing names like "super indo", "prenium indo" or kratom 15x. Nothing wrong with brand names, but I would be confused if my supermarket would start labeling his coffee or pepper in the same way. We like to focus only on one label, good kratom! 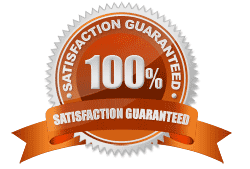 We currently have Good Sumatra Kratom, Good Borneo Kratom and Good Indo Kratom for sale, plus we create special blends of kratom for various resellers. All is 100% organicly grown, gathered from mature trees, properly dried to maintain its alkaloid content and processed in propper and clean manner.